Our carpet and upholstery cleaning work is second to none, and we also specialize in hard to clean materials like fine drapery. Our customer service will exceed your expectations, and all of your needs are attended to in a personal and professional manner. We are completely equipped to handle all types of professional cleaning work. We stock different types of cleaning agents and specialty products to handle the more tricky cleaning situations we encounter. The quality of results we produce cannot be accomplished on your own with a store bought product, or by inferior equipment. Professional carpet and upholstery cleaning is not a product; it’s a service. When you want great service and great results, call a professional: STATEWIDE CLEANING. You will be glad you did. 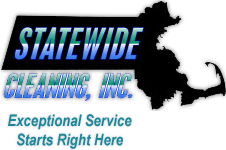 Statewide Cleaning provides professional cleaning services to clients all over suburban Boston, and other areas by special appointment. We cater to the most discriminating customers who prefer a very high level of service and need their special cleaning needs met in a very skilled manner. In cases where it is not practical to perform our services with our large truck, we also have a smaller well-equipped vehicle for inner city areas of Boston. Either way, we will resolve your cleaning needs in a very professional manner. We love cleaning carpet and upholstery and our quality of work shows that! This website does not list everything we can do for you. We have highlighted our most popular services for your information, and we look forward to the opportunity of providing you with more. We offer free estimates, and will be more than pleased to meet you and survey your cleaning needs. Chances are, we are already equipped for it and have already done it for a previous customer. We are in Boston every day, so we can always stop by to see you.